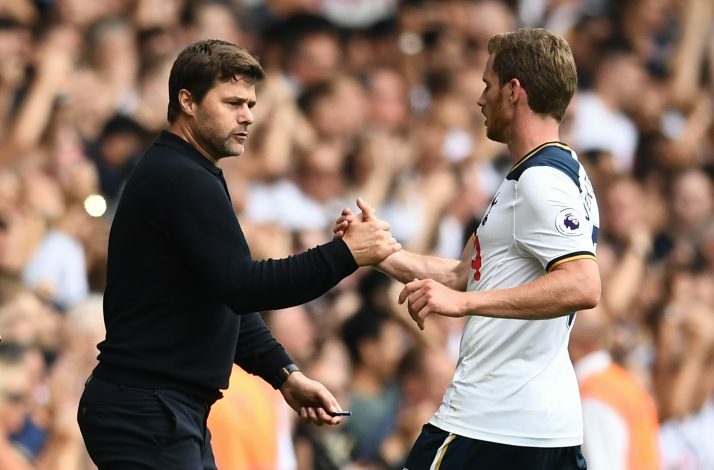 Tottenham Hotspur’s players were concerned over losing manager Mauricio Pochettino to Manchester United last season, Spurs defender Jan Vertonghen has revealed, as per Express. Pochettino was tipped as a perfect replacement for Louis van Gaal, and the rumours spread like fire when he was pictured having lunch with United’s director, and former manager, Sir Alex Ferguson in May. But the Spurs boss showed his loyalty and penned a five-year contract extension later that month, and the Old Trafford hierarchy announced Jose Mourinho as their new manager after sacking van Gaal in the summer. When questioned if the players were uncertain about Pochettino’s future at the White Hart Lane, Vertonghen admitted: “Yes, when the rumours were getting bigger we were always worried, especially with this manager. Pochettino and co. will be up against Jose Mourinho in Sunday’s high-octane Premier League encounter at Old Trafford, and Vertonghen has made it clear that his team will not encourage any ill effect of the mind games the Portuguese tactician prefers ahead of every crucial match. “He is a good manager, he says things in the media but it doesn’t really affect us. It’s part of the job and he plays it the way he wants to,” the Belgian further said. Tottenham are now only three points behind fourth-placed Manchester City, while United are nine points adrift. Therefore, the Sunday fixture could heavily determine both team’s Champions League qualification hopes.